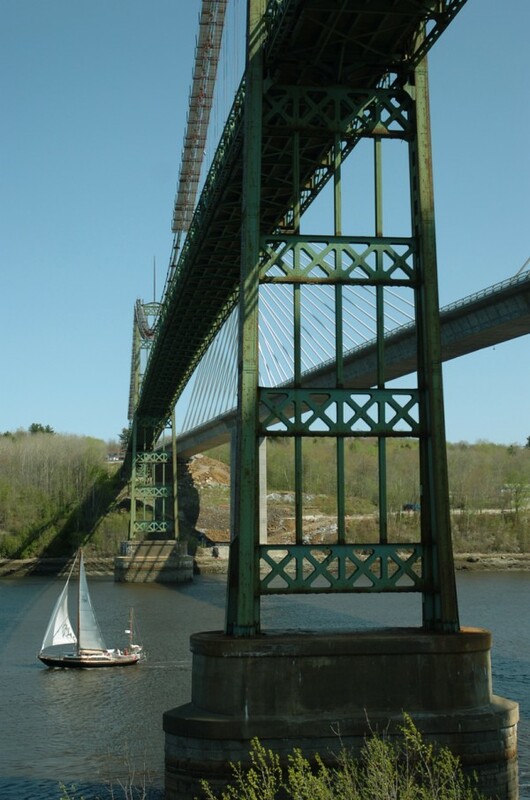 The Fleana, a 38-foot yawl, sails under the Penobscot Narrows Bridge and the old Waldo-Hancock County bridge Monday, May 14, 2007 on its way to Bangor after returning from Ireland. The DOT is preparing to demolish the Waldo-Hancock Bridge, shown beside the new Penobscot Narrows Bridge recently. The Waldo-Hancock bridge is seen in this photo. Young peregrine falcons scramble as one of the adult birds (right) returns with food in June 2009. The birds wee nesting in a box installed on the Prospect side pilon of the old Waldo-Hancock Bridge. 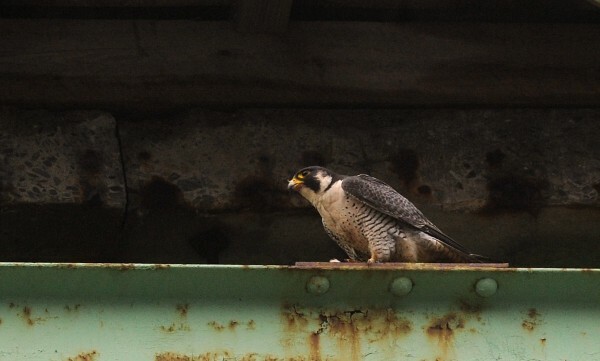 A peregrine falcon on the old Waldo-Hancock Bridge in June 2009. VERONA ISLAND, Maine — For the low-bid price of about $5.35 million, the suspension bridge that spanned the Penobscot River between Waldo and Hancock counties for more than 80 years will finally be demolished this fall. S&R Corp. of Lowell, Mass., is the low bidder for the takedown of the now-rusted and unusable Waldo-Hancock Bridge, which was replaced in 2006 by the Penobscot Narrows Bridge and Observatory. “We’re hoping the paperwork will be finalized next week sometime,” said Maine Department of Transportation project manager Doug Coombs on Friday. “The actual work for the demolition of the bridge itself should start on Oct. 1.” Coombs said the deconstruction should be complete by early summer in 2013. S&R squeaked by Cianbro Corp. of Pittsfield for the low bid, Coombs said. Cianbro’s bid carried a price tag of about $5.67 million. 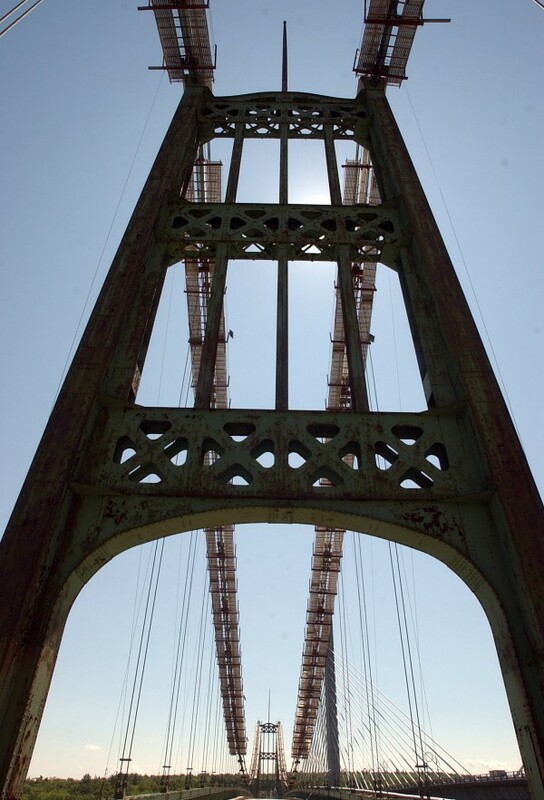 State and local officials had hoped to remove the deteriorating bridge not long after the Penobscot Narrows Bridge and Observatory opened in January 2007. But securing the necessary authorizations and funding for the massive project took longer than anticipated. When it opened in 1931, the Waldo-Hancock Bridge was the first permanent bridge across the Penobscot south of Bangor and replaced a ferry system for cars. But in 2003, the state decided the bridge had deteriorated beyond repair and needed to be replaced. Nearly a decade later, the old bridge is a rusted skeleton beside its towering, $85 million replacement. The bridge’s demolition isn’t expected to affect traffic crossing from Verona Island into Prospect, Coombs said, but may create complications for mariners travelling up and down the Penobscot River. To limit inconvenience for commercial and recreational boaters, DOT will work with the U.S. Coast Guard to coordinate the flow of marine traffic through the channel, he said. In the early 20th century, the Waldo-Hancock Bridge cost $846,000 to build. That’s $12.77 million in today’s dollars. It spans 2,040 feet, 135 feet above the water. Its towers are 206 feet high. By comparison, the Penobscot Narrows Bridge — which was speedily built while the state implemented stop-gap measures to temporarily strengthen the old bridge — cost $85 million to build and is 2,120 feet long. Its towers are 440 feet high. S&R will tear down the bridge piece by piece, starting with the roadway, or deck. Sections of the deck about 25 feet long will be lowered one by one onto a barge in the river below, starting with the center of the span and working back and forth toward either shore. Next, the steel cables will be removed, then the towers. The company will take care of the bridge materials, but some relics will be saved for posterity. “The two flagpoles on top of each tower, each one of those will go to [Verona Island and Prospect],” Coombs said. Those towns also will receive sections of suspension cable, as will Bucksport. 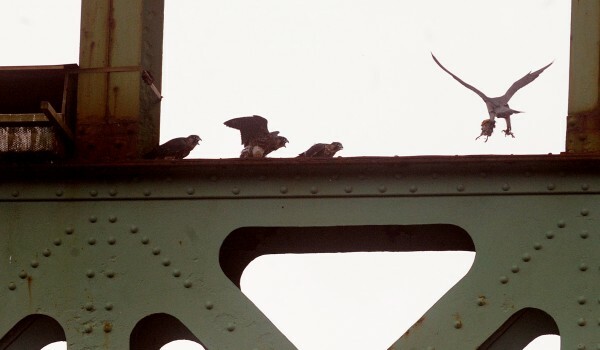 Considerations also are being made for the osprey and peregrine falcons which nest atop the Waldo-Hancock Bridge. Coombs said the Oct. 1 start date was chosen because by then the fledglings are capable of flight and have left town. The DOT is working with Maine’s Department of Inland Fisheries and Wildlife to relocate the falcon next to a nearby shore site. On the Prospect side of the river, they will build an osprey nesting stand. Sentimentalists and historians also will be happy that the 81-year-old bridge won’t disappear completely: The concrete piers that support the bridge’s towers will remain in the water, Coombs said. And the construction of a “historic viewing area” on the Prospect side, complete with information about both bridges, mean the bridge won’t easily be forgotten. 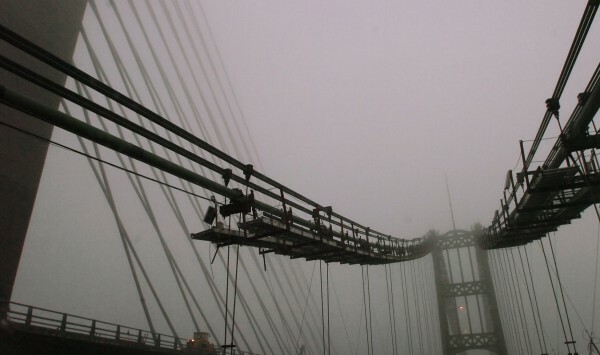 “You’ll always be able to look out across and see where that bridge was,” Coombs said.